There are nine stories in all, each of them exactly 999 words long. The podcast is available in three episodes, each containing three stories. To read the stories or see a map of where they take place, visit StreetwiseCycle.com. Author Cheryl Klein calls The Streetwise Cycle "perfectly internet-sized stories of interconnected Angelenos." –Bronwyn Mauldin is the author of The Streetwise Cycle and creator of GuerrillaReads, the online video literary magazine. Bronwyn's writing has appeared in CellStories, The Battered Suitcase, Blithe House Quarterly and Clamor magazine. 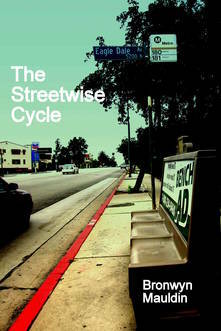 We will send The Streetwise Cycle to your Kindle at . The Streetwise Cycle has been sent successfully to your Kindle!